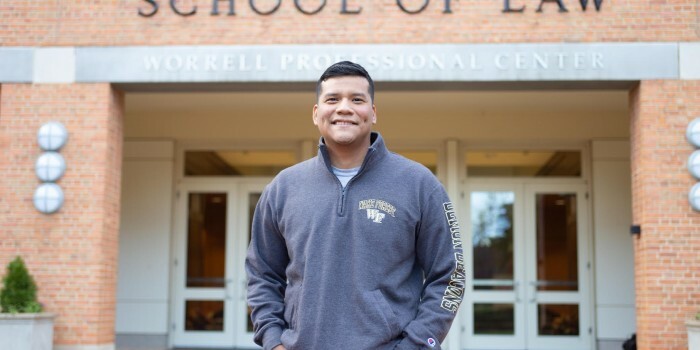 Agustin Martinez (JD ’20) experienced the power of the Wake Forest alumni network during his 1L summer. In addition to connecting with alumni in Minneapolis, Minnesota, he was able to spend his summer gaining experience in employment law as an intern with Ogletree Deakins and Supervalu Inc. I have two homes: Veracruz, Mexico, where I was born, and Shelby Township, Michigan, where I was raised. What did your major in? Describe your 1L and/or 2L summer work experience. Please provide your title if applicable. I spent my 1L summer in Minneapolis, Minnesota, where I split my summer with a Ogletree Deakins, a law firm, and Supervalu Inc., a corporation. I had a great summer working on employment law and regulatory matters. One of my favorite experiences was getting to know some Wake Forest Law alumni from the Twin Cities — they were very welcoming and eager to help me in any way that they could. Are you working in a specific area of law? If so, what do you find interesting about it? During my 1L summer, I mostly worked on employment law cases. I really enjoy this field, because of my human resources background and because the field is so extensive. For example, during the summer, I worked on a variety of employment law cases, ranging from whistleblower claims to wage and hour claims. Why did you decide to attend Wake Forest Law? I decided to attend Wake Forest Law for several reasons. First, attending Wake Forest meant that I could be closer to my fiancée, who was living in North Carolina while I was in Michigan. Second, I instantly felt right at home when I first toured the campus. And lastly, I believed that the school’s strong national reputation would open up opportunities for me in other states in case I decided that I did not want to stay in North Carolina or move back home to Michigan. Describe the Wake Forest community. Wake Forest is a small and close-knit community. The students pretty much know each other, and the professors, as well as the administrators, are very accessible. What is your most memorable experience during law school (thus far)? Thus far, my most memorable experience during law school was winning the Kilpatrick Townsend 1L Mock Trial Competition at UNC Chapel Hill with Scott Harvey (JD ’20), Melissa Malone (JD ’20), Rachel Boyd (JD ’20), and Kelechi Ohanu (JD ’20). We enjoyed competing and defeating teams from all the law schools in North Carolina. And we had a great time just hanging out. What are you involved in outside the classroom (i.e. student organizations, pro bono project, intramural sports, etc.?) How does this add value to your overall law school experience? I am a teaching assistant for first-year Legal Analysis, Research, and Writing (LAWR). Additionally, I am a member of the Wake Forest Law Review, Moot Court Board, Student Trial Bar, and member of the “Conversation With” Speaker Series committee. These activities have allowed me to meet so many other great individuals and have made my law school experience even more enjoyable. Where do you want your law degree to take you? I hope to become an effective litigator after law school. And maybe down the road, I will consider a teaching career.